At this time, there is no cure for fatal Alzheimer's disease and prevention is key to avoiding this 6th leading cause of death in the U.S. Fitness has been found through research to be instrumental in prevention. As the world population continues to grow and live longer, the issues of accompanying cognitive decline, dementia, and fatal Alzheimer's disease are becoming more prevalent, significantly impacting quality of life, health care systems, and the economy of many countries. 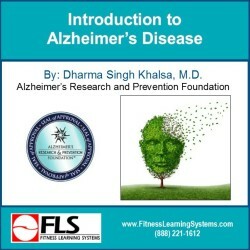 This course provides important information to help you understand cognitive decline and Alzheimer's relevant to anyone working as a health-fitness professional. It focuses on causes, risk factors, diagnosis, care partners, The 4 Pillars of Alzheimer's Prevention™, and preventive mental exercise. Discuss the statistics for Alzheimer's disease, and the social, economic, and care partner impacts. Discuss statistics and demands for care partners, including tips to overcome 8 obstacles that may be encountered in the care giving process. Identify 8 parts of the brain and describe the basic function of each part. Define 4 terms related to cognitive decline: dementia, subjective cognitive decline, mild cognitive impairment, and Alzheimer's disease. Explain 7 potential causes that may contribute to cognitive decline and Alzheimer's disease. Identify 8 risk factors for cognitive decline. Explain 4 ways to reduce risk factors to optimize brain health. Identify the symptoms for cognitive decline using the 3 stage model. Describe how subjective cognitive decline, mild cognitive impairment, and Alzheimer's disease are diagnosed. Identify the stages of disease using the seven stage model. Explain 3 current medical approaches used for Alzheimer's disease. Identify 2 studies supporting an integrative medical approach to preventing and treating dementia and related disease. Describe The 4 Pillars of Alzheimer's Prevention. Explain how to use brain aerobics and the practice of Kirtan Kriya as preventive mental exercise.